I had the vague idea that giving up full time work would cause an increase in leisure activities. Reclining on the sofa, listening to music. Sitting in a cafe in Greenwich and sipping a coffee whilst reading a book. Meals out with friends in restaurants etc. I’m not complaining there has been an occasional bit of that, but a great deal of sitting under an umbrella trying to paint. Also all the stuff you need to do in order to paint. 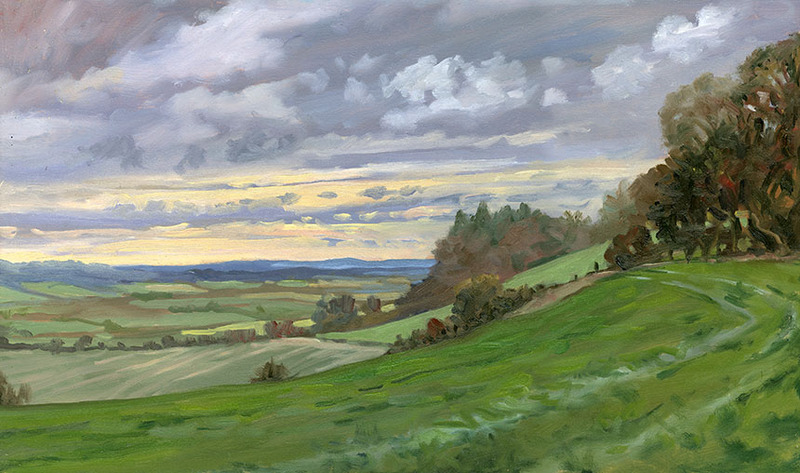 Finding subjects, buying materials, stretching canvasses, framing pictures, priming boards, blogging and building various ingenious plein air gizmos. 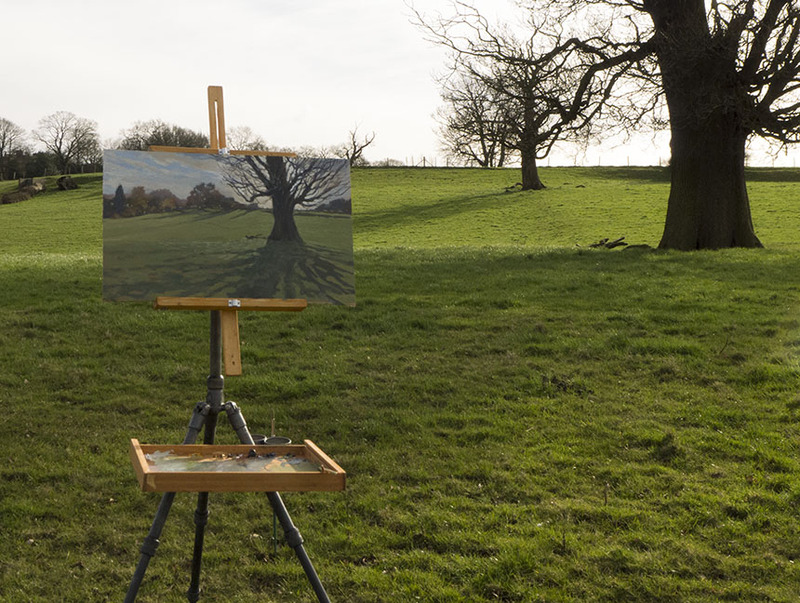 The gizmos in this case are a method of painting larger plein airs. Just a modest increase to 20in by 12in. The trouble with pochades is that this means a whole new box. So I decided to make an easel attachment for the tripos and a hook on palette, then team that up with various sized wet panel boxes. 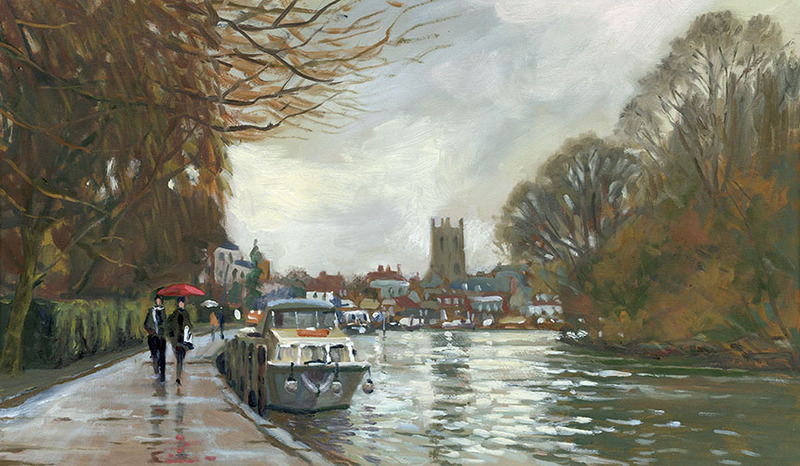 I have in mind that I am going to France with the Wapping Group again this year, which means getting the luggage for a holiday and also all the gear needed for painting and then getting the resultant wet paintings home again. In previous years I have ended up with a case entirely filled with painting clutter and only room for one pair of trousers and some underpants/paintrags! 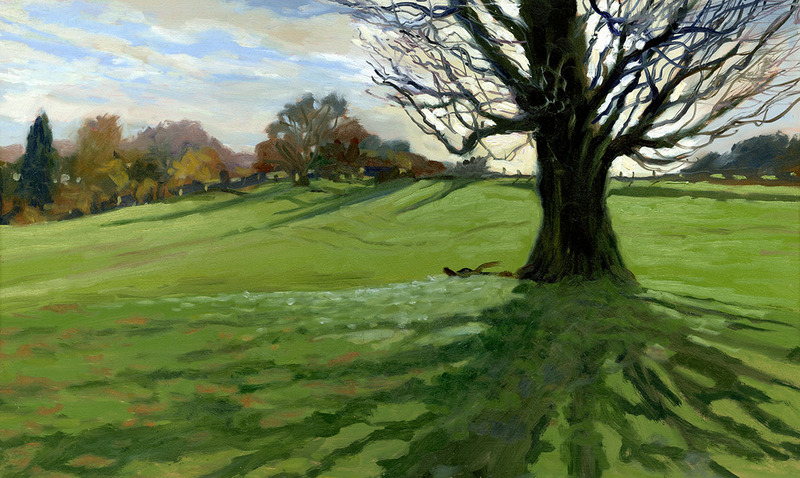 I really have to start painting some more ambitious plein airs, 20in by 16in at least. This is of course going to require more carpentry though I won’t need a carrier that holds more than two panels at that size. I can also paint four 10in by 8ins on such a panel and chop them up after! I have at last got down to some studio work and have several paintings on the go at the same time. I am a bit uncertain about posting work partly done but I suppose it is of interest. I like seeing work in that state by other artists myself so I suppose I should. This working on canvasses in rotation is very new to me we shall have to see how it goes, with oils though I find “a la Prima” too limiting as I wish to use glazes and such. In the next post hopefully. 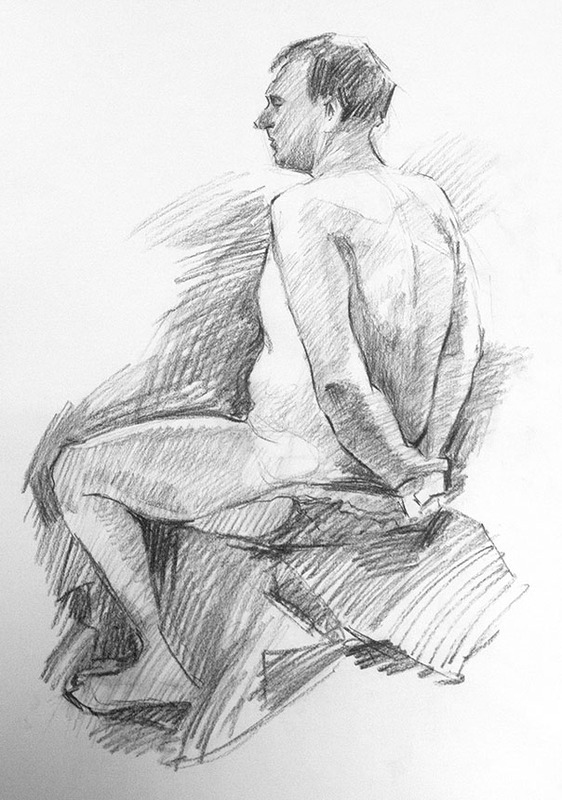 Life drawing is another area in need of a revolution. I have got too cosy with the pastels on toned paper. It is too easy to get a beguiling effect without enough substance. In effect you need to do less looking which is on reflection a bad thing. 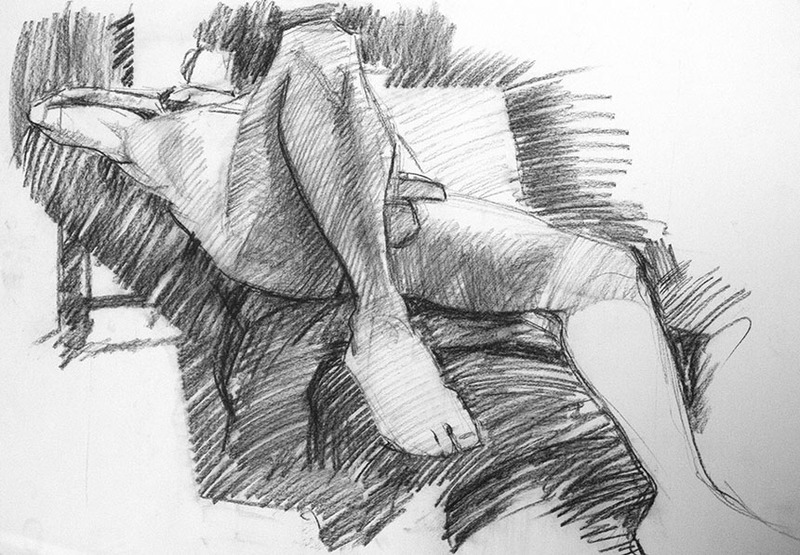 So I am going back to basics, white paper and charcoal. First results are not promising… I’ve put them below for you all to laugh at! One thing I hit straight away was that dealing with the medium needs a new set of technical skills. I have to explore the mysteries of “stumping”, I will report on the hows and how nots once I have got a reasonable handle on the process. Enough of that I have quite a backlog of pictures to post. 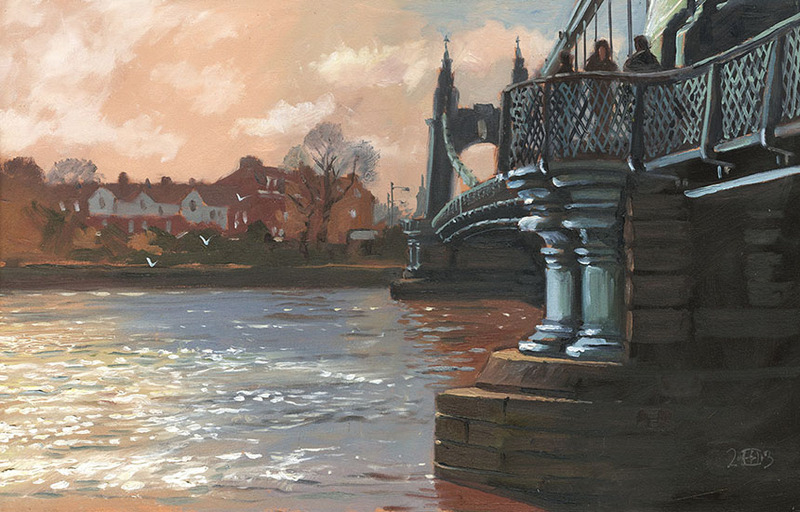 A left over from Hammersmith, I got this mostly blocked in but ran out of time on the bridge when the sun came right into my face. I need to go back and do a bit more on the bridge as the photo ref I finished it off with is not too good so the structure is too fussy. 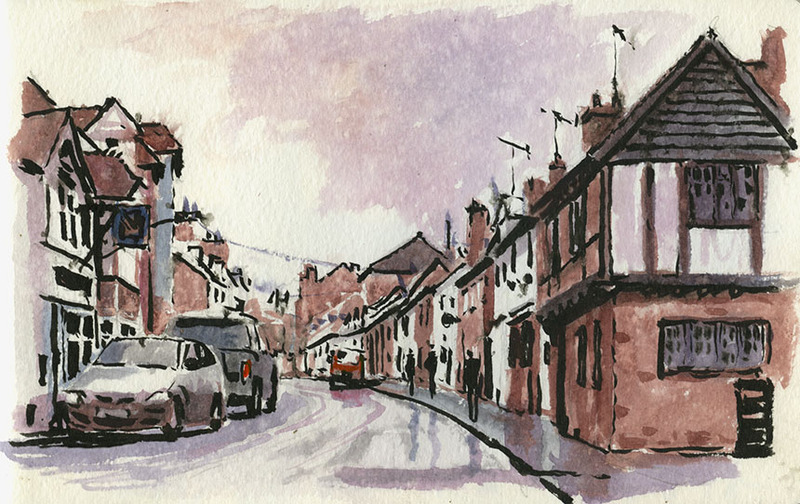 A visit to Westerham in Kent. I couldn’t find anything that took my fancy so I walked a little up the hill. This tree against the light was fun.Not sure about the tree itself, needs simplifying in some way. This is the first outing for a larger size so this is 20in by 12in. The new gizmo worked fine though. Here is my set up. Quite simple a palette box with lid, so that I can leave the paints out and don’t need to clean up between pictures. 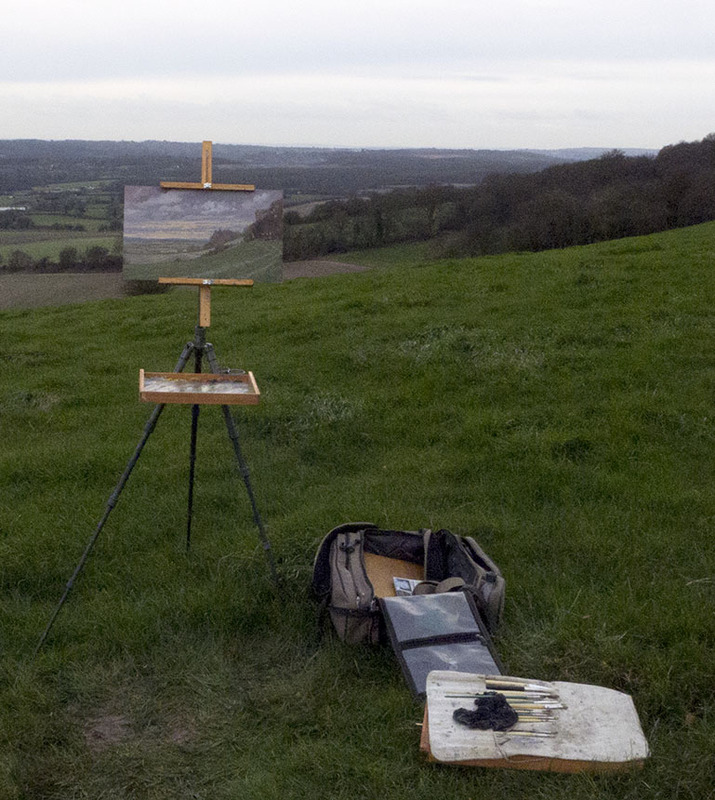 An easel attachment for the tripod. Out of sight is the 20in by 12in panel box. It’s no lighter than my previous smaller box, the only downside is that the panel box has to be strapped to my pack on the outside as it is too big to go within. This is towards the end of the day on the charmingly named “Hogs Trough Hill”. The light was super, though once I stopped it was very cold! 20in by 12in. I don’t usually go for those “I wos really there honest !” pictures, but this shows the pack and under the brush roll the panel box. 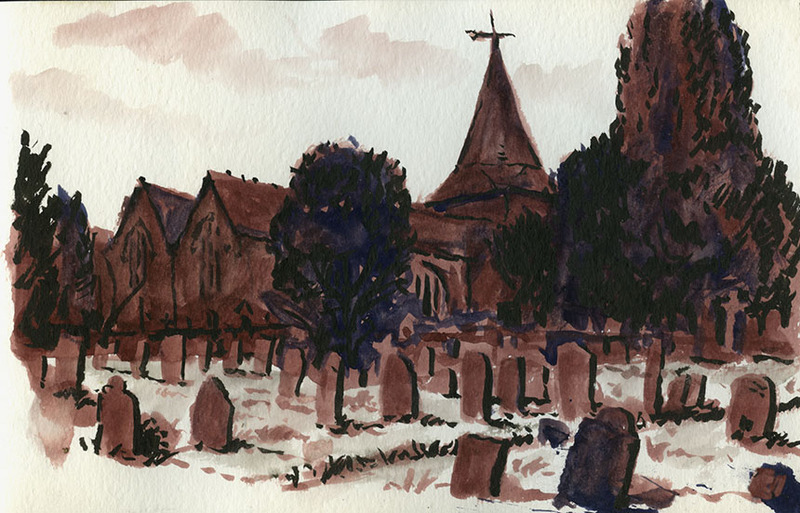 Last Westerham, a quick sketch done while it drizzled on me of Westerham church. I feel I ought to post the misses as well as the hits. 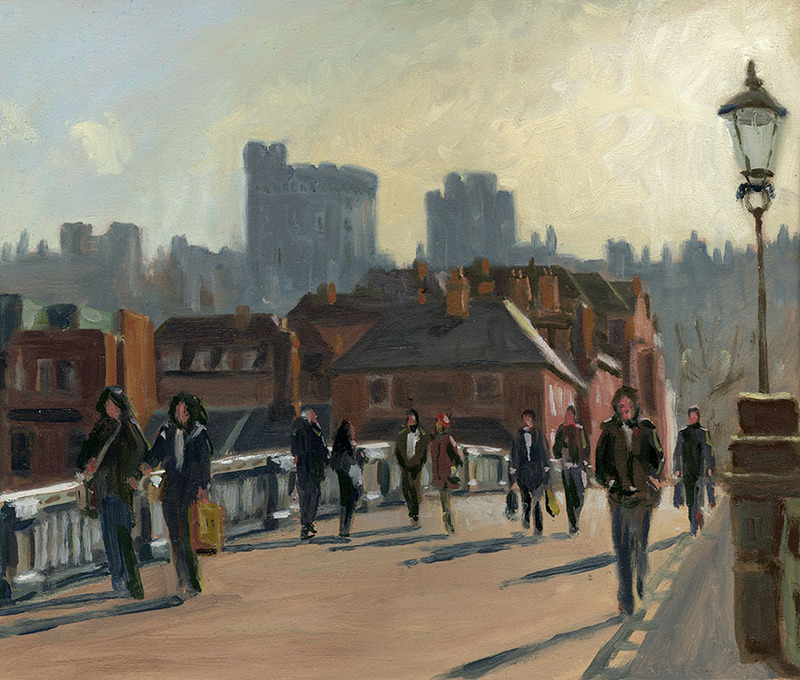 This is Windsor from Eton it was a great subject, but I just didn’t catch it… one for the scraper! Another stinker, the light was poor but that is no excuse I just couldn’t seem to see how to make it into a picture, horrid figures too! 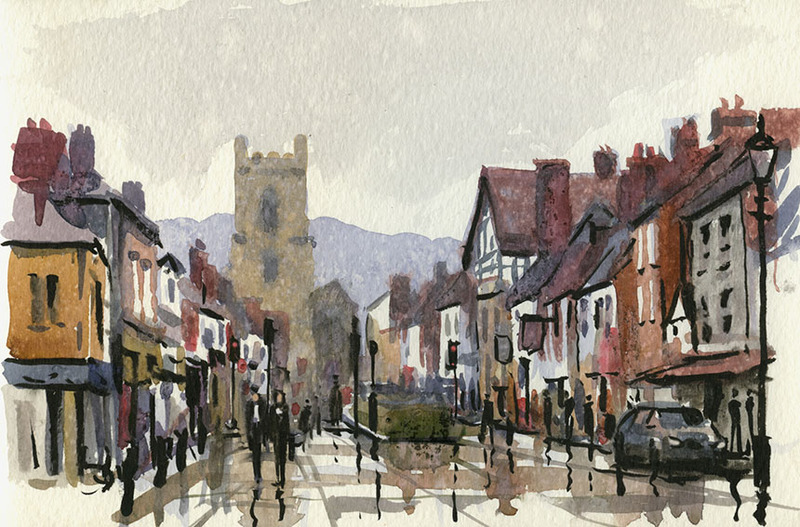 Slightly better this one, a very wet day, we were all struggling I think, except Mike Richardson who painted a great one nearer to the town. It just goes to show there are good pictures on any day, it is just spotting them that is hard. The last day, these were all done on a visit to Steve Alexander who very kindly hosts “Painting Fests” and puts us all up in his house, so big thanks to both him and his partner Anne! 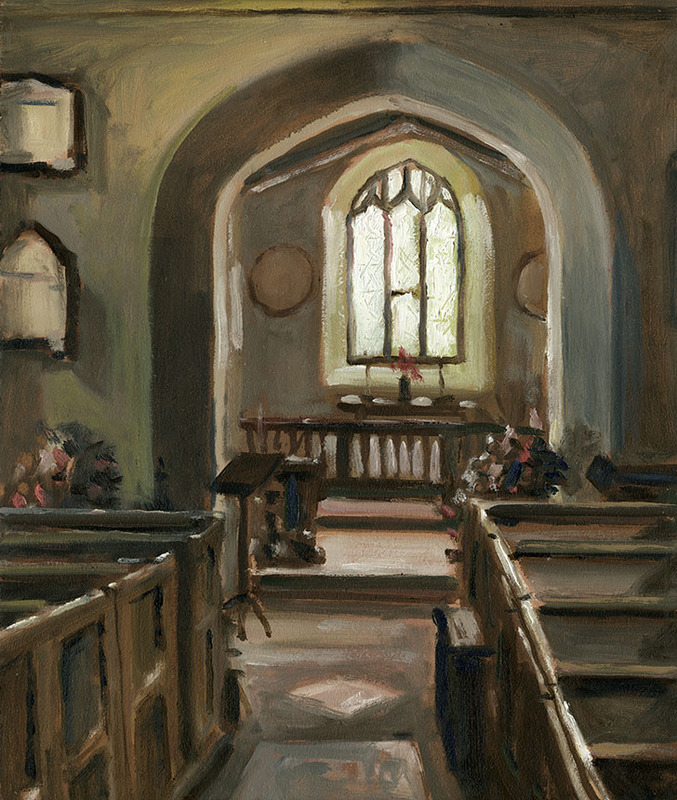 The weather was so dire we painted in a local church, this is Hartley Winton. This was fun but very cold and I should have spent longer on it, but the nearby cozy pub needed visiting. Very hard to do this crouched under my brolly with the rain chucking it down… the dappled effect in the sky is from the rain blowing in! 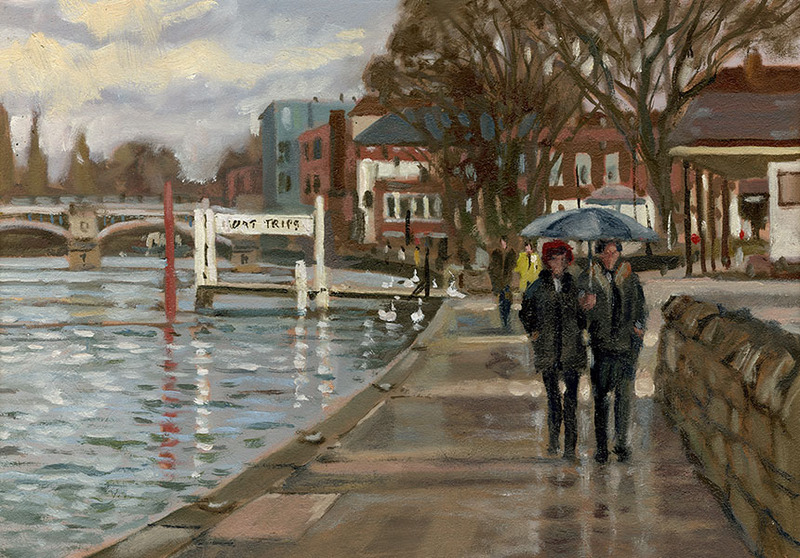 Henley again, I was about to head home but started this, again it was raining hard, I must be mad! 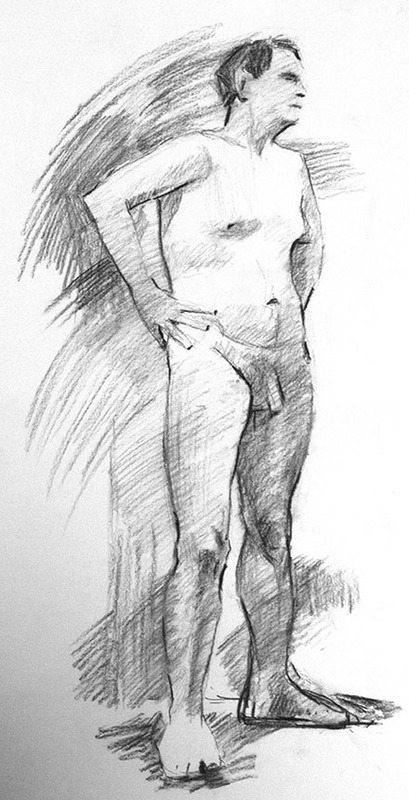 A few charcoal life drawings and that will have to be all, I have still not caught up, I seem to be painting faster than I can post. People talk a lot about values as if they there is a correct value for light or dark in a subject. I don’t really think that there is though. Very little is said about Key or Value Scale which is I think of equal importance. 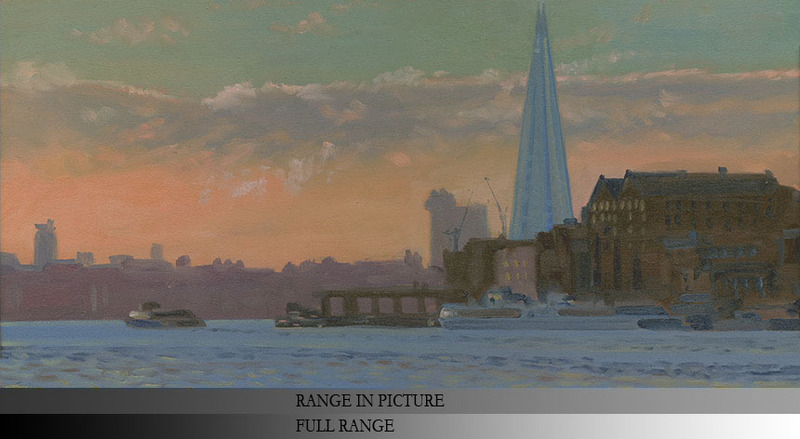 Key for those that haven’t met the idea is the range from light to dark in a painting. So a painting that has most of it’s values in the lighter range is called high keyed. Setting the key of a picture is a choice made by the artist rather like setting the exposure on a camera. If you decide the lightest value in your picture and the darkest value then it is the relative positions of the values in your picture that matter. You can choose a narrow key in which case the lightest is pale grey and the darkest mid grey, or a wide key in which the lightest is white and the darkest black. The same picture can be painted in either key, neither is more correct or incorrect than the other. It is the relationship between tones that matters and gives coherence and believability to your picture. I have briefly I think dealt with this before but this I hope is clearer. I’m going to use a plein air of Rotherhithe which lends itself to the subject. First The picture as I painted it. At the bottom are two value scales. The bottom one the full range of possible values the top the ones actually used. Below is a diagram to show the spread of values. As you see the lightest possible lights and the darkest possible darks are not used in the painting. The space between the lines is the Value Range or Key. The top strip is just the area between the lines stretched to fit. Here is the same image in grey scale. So how would the painting look if I had used the full range? Below I have done a photoshop adjustment that gives some idea. Here it is. As you can see the picture is more contrasty and the two range strips more or less match. It still looks fine because all of the values have been stretched to fit and the relative positions are unchanged. This is rather using an elastic ruler. You are stretching the whole thing but it still has twelve divisions equally spaced. Here it is in grey scale. As you see this looks fine and probably about how I would choose to draw the scene in black and white. See that the two strips now more or less match. So what happens if we go the other way? This time we will narrow the value range rather than expanding it. It takes a moment to adjust your perception so look at the image above in isolation for a few moments. The mood has changed but the picture still works we have no difficulty in believing such a day and mood of lighting is possible. Below is the same thing in grey scale. As you can see it has rather the feel of a foggy day, but is still perfectly plausible. In fact faced with this subject you could have painted in any of the value ranges above and it would have been perfectly valid. So remember, when you start a painting first make a decision as to the Key. Put dabs on your canvas of the lightest and the darkest you intend to use and then stick to that range of values and place your other tones between those extremes. It is your decision as the painter not necessarily set by the subject, though some subjects obviously lend themselves to a particular range. On advantage of this approach is that if, when your painting is almost done, you need to punch an area up you will have the means rather than being stuck in the position of needing a white that is whiter than white!